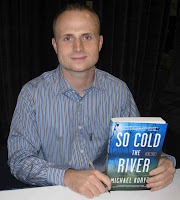 As some of you know, I recently interviewed Michael Koryta, the award-winning author of the Lincoln Perry series of novels, as well as the standalones ENVY THE NIGHT and the recently released supernatural thriller SO COLD THE RIVER. Parts of that interview will be turned into a feature article for the September issue of Good Reading magazine, and I hope to use other parts of the interview for other articles as well. I will of course share the 9mm questions part of our hour-long interview on Crime Watch soon. Koryta is one of the 'young lions' of crime fiction, so to speak. His debut novel, TONIGHT I SAID GOODBYE became an Edgar finalist, and was published when he was just 21 and an undergraduate at Indiana University (I feel so old). He has also been a private investigator and award-winning newspaper reporter. He now divides his time between Bloomington, Indiana, where he teaches at the Indiana University School of Journalism, and St. Petersburg, Florida. You can watch a cool little YouTube video of him talking about his latest novel, the supernatural thriller SO COLD THE RIVER, below. I really enjoyed our interview, and am looking forward to writing some articles about him. But while you are waiting for my article(s) on Koryta, you might like to read an excellent interview with Koryta by thriller writer Jason Pinter, that was published in The Huffington Post this week. "So Cold the River is a breathtaking departure from Koryta's crime novels, upping the plotting and characterization skills that Koryta has displayed through five books with the tale of a down-on-his-luck filmmaker, Eric Shaw, lured to West Baden, Indiana to document the life of dying tycoon Campbell Bradford," says Pinter in his introduction. "The result is a gripping, terrifying, and sometimes astonishing read." You can read the full, very interesting, interview here. Are you planning on reading SO COLD THE RIVER? Do you like it when your favourite crime writers stretch themselves into the supernatural (ala Dennis Lehane, John Connolly etc)? Have you read Koryta's earlier works? What do you think? Please share your thoughts. I have an award for you on my blog, www.theblacksheepdances.com. BTw, love your choices. You're making my wish list far too unmanageable.